Can you believe Halloween is just two weeks away? Don’t worry, though. You still have time to order custom Halloween wine labels for your bottles of homemade wine and brew. Your bottles will be the hit of your Halloween bash, and adult “trick-or-treaters” will love them as gifts. 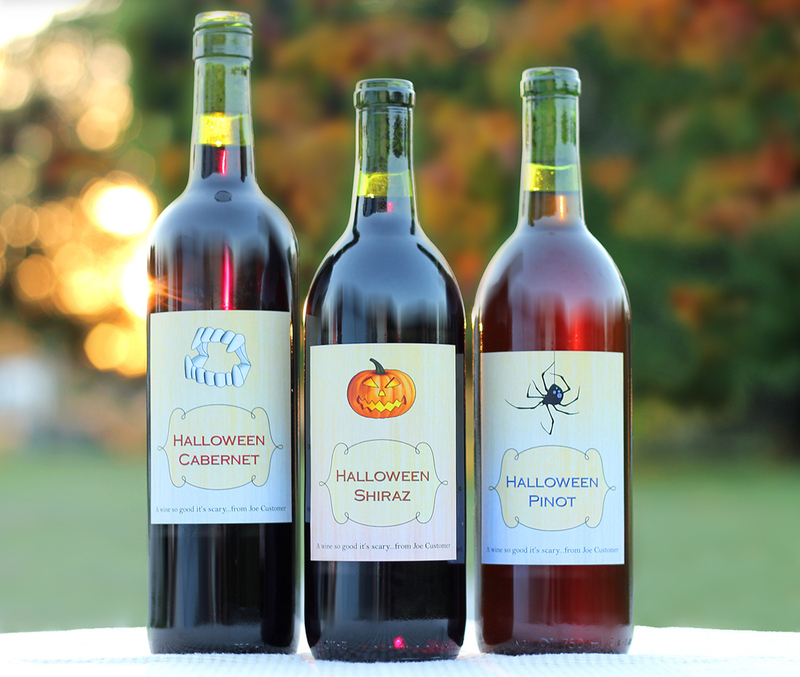 You can find more custom Halloween wine labels to choose from at our label gallery. To make sure you receive your labels by Halloween, simply place your order by October 26. We’ll print your personalized wine labels and ship them to you right away, so you’ll have them by October 31. Use a personalized photo label with a picture of you in costume to decorate your homemade wines for your Halloween party. Or choose one of our pre-designed label templates, ready to customize. These festive labels are a unique and seasonal way to wrap bottles of homemade wine to give as gifts. Or use them as table centerpieces and decorations at your Halloween party. Go to the label gallery now and place your order, and you’ll receive your labels in plenty of time to enjoy on Halloween. It’s easy to get your labels! All you have to do is select your template and customize the text. You’ll see a preview of your label on the screen before you order, so you’ll know exactly what you’re getting. Then place your order. We’ll print your labels and ship them to you. All you have to do is put them on your bottles, and you’re good to go! Also, be sure to check out our other holiday wine label designs. Remember, the other winter holidays are right around the corner. Beat the rush by ordering your Thanksgiving, Chanukah, Christmas, and New Year’s Eve wine labels now. Happy Halloween from Noontime Labels! Join our email list! Click here now. This entry was posted in Custom Labels, Homemade Wine, Miscellaneous and tagged Beer, Bottles, Gifts, Halloween, Homemade, Labels, Parties, Wine by Noontime. Bookmark the permalink.